Coburn Technologies Introduces New Portable Slit Lamp, SK-LS-1B | Coburn Technologies, Inc.
Coburn Technologies, a leading provider of innovative, end-to-end customer solutions to the world’s ophthalmic lens processing industries and eye care professionals, introduces a brand new portable slit lamp to their diagnostics product line – the SK-LS-1B. “We saw an opportunity in the industry for a user-friendly, more mobile solution for slit lamp examination in eye care professionals’ practices, and wanted to offer something that expanded our currently SK family product offering,” states Alex Incera, President of Coburn Technologies. The SK-LS-1B portable slit lamp is an ideal solution for ophthalmology, optometry and veterinary practices. 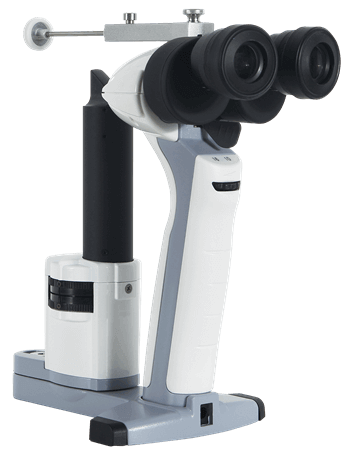 With its hand-held operation, users are able to examine patients who don’t have ability or cannot sit comfortably at a traditional slit lamp. It is extremely light and portable and comes in a custom case to easily carry and store. One-hand operation: A built-in, one-touch, magnification switch makes it easier for doctors to perform inspections. Increased slit angle: Built with a maximum illumination angle of 60° helps practitioners and veterinarians get a better slit view of the cornea. Stronger LED illumination: Designed with 3,500K color temperatures for prestige viewing, while helping users relieve visual fatigues. The SK-LS-1B is FDA approved, and now available through Coburn Technologies. For additional information, visit www.coburntechnologies.com, or call 1-800-COBURN-1.